I talked about the following attributes of every loop you cast. Shape – Fat or wide, Parallel or tailing. Let my now give you my thoughts about what you need to consider if you want to make better loop shapes. Now, ‘it depends’ but in general a reasonably narrow and parallel loop is what you are trying to achieve. 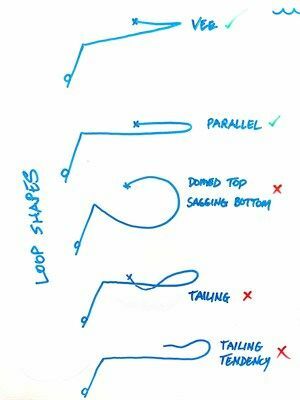 If you can learn to make this loop shape well under a variety of conditions then all other loop shape will come more easily. Keep in mind that the single biggest problem I see when helping intermediate/experienced casters is the dreaded tailing loop. This is the loop that we almost never want under any circumstances. This is a tangle maker, it is a wind knot maker and it lacks power and accuracy. Learn to avoid the tailing loop like the plague. First let me explain to you how I view all loop shapes. Any unrolling loop has 3 component shapes. Top leg or leader leg. Bottom leg or rod leg. I can watch and change any of the three shapes for the next casting cycle if I want a different shape. Now let me tell you the factors that effect the top leg shape which is the most important. ‘It depends’ – but, this is the most important one to get right, and understand, first. I know it is a generalisation and once again, ‘it depends’ but if you can learn to get this top leg as straight as a die and aimed on a trajectory toward the target you have more or less made it as a fly caster. The shape of the top leg CAN ONLY BE FORMED by the path that the rod tip towed the line thru the air. If the rod tip domed on the way the top leg shape will be convex or rounded. This is typical behaviour from a beginner that might use too much wrist. If the top leg is dipping down then rising up again in a concave shape then the rod tip MUST have towed the line thru the air in this manner. This is the tailing loop.What we want is a straight line top leg. We need the rod tip to tow the line through the air in a straight line path (SLP). Next time you practice I want you to put all your focus into watching the top leg of your unrolling loops. Try to get them straighter and aligned with the target. When you practice I do not believe that you can straighten up the top leg unless you understand the following. What are the variables within the casting stroke that effect the tow path of the rod tip and therefore the shape of the top leg?The only variable that effects the rod tip tow path is how much your rod bends each time you move it through the casting arc. There are two variables that effect how much the rod will bend each time you move it and therefore what position the rod tip moves through the sky in. 1. The amount of flyline out the tip of the rod and therefore the weight of this flyline. Naturally the line weight acts on your bendy 9 foot fly rod and bends it to an overall length that is somewhat shorter than the original and straight 9 feet. If the rod does not bend enough when you move it through an arc the tip path will be domed or convex – so too will the shape of the top leg. If the rod bends too much then the tip will drop down below the SLP, the top leg shape will also reflect this shape and you will end up with a tailing loop. If you can get the bend depth just right for the casting arc then a SLP of the rod tip travel will result and you will get a straight top leg. Therefore 2 feet of line will weigh 2 grams etc. If I was to cast 30 feet of line there would be in effect a 30 gram sinker or weight causing the rod to bend down. If I lengthened the line on the next false cast to 40 feet then the weight changes to a 40 gram weight and so on. Do you get that? Lure fishermen always operate with exactly the same weight between casts. When the lure is first tied on it may weight say… 20 grams. Guess how much it weighs after cast number 20? Yep… 20 grams. Then at cast number 500 it still weighs 20 grams. Fly fishermen are constantly (sometimes 10 times within the same cast) dealing with a different casting weight. Every time you allow some line to slip through your fingers the line outside the rod tip gets heavier. As the line weight increases with line length we must use a larger casting arc to accommodate the larger bend otherwise we will likely throw a tailing loop. Excess power will make the matter worse. You will cause the rod to bend even more. So, if you throw lots of tailing loops back off the power and open up the casting arc. Your top leg will then become more straight and the loop more parallel. If you move the fly line slowly then the rod does not bend very much. If you move the same length line faster then you will find the rod will bend more. So, depending on how fast you are moving the fly line the casting arc will have to be of an appropriate size to accept the rod bend depth. If you tow the line more quickly and you do not increase the size of the casting arc then you may get a tailing loop ! In a follow up blog I will tell you much more about the variable casting arc and give you what I consider to be the single most important and effective casting drill that I can teach you. Having said that, the next blog post will be a second, and much more more important, woolly jumper story. Please consider sharing my notes with other like minded fly fishers.